Is Labor Day for Workers or Politicians? Berlin Every four years Labor Day marks the official beginning of the “real” campaign for President in the United States. Of course these campaigns are endless and began years and years before for most candidates, like a Hillary Clinton. Even Mr. Surprise Candidate, Donald Trump, has been hard at it for at least a year now. Both candidates had their big-bodied planes in Ohio on the same tarmac on Labor Day. Reporters could run back and forth between the planes. Candidates could nod in each others’ direction and note how important Ohio is as a battleground state. Democrats could show up at some of the few remaining Labor Day parades, marches, picnics, or whatever we might call them and genuflect to what’s left of the remaining power of labor unions, much of which is in fact on the goal line stand defense of politics and elections. It is worth wondering if Labor Day really exists anymore to celebrate workers and their unions or just an easy access bridge for politicians to have their photo ops with workers, and then move on to more fundraisers and other touchstones of micro-targeting. It goes without saying for most people Labor Day is more the mark of the end of summer and perhaps the beginning of school sessions, and a last chance at a 3-day holiday in the long stretch until Thanksgiving. What’s labor got to do with it? In 1894, it [Labor Day] became a national holiday in Canada. The Canadian government was seeking to accommodate the Labour Movement after the rise of the Knights of Labor and the strengthening of unions in the 1880s. 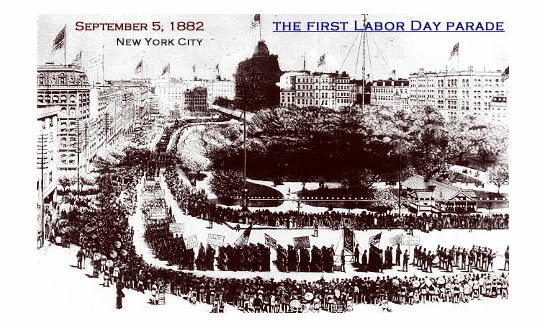 Shortly after, the American government followed suit, wanting in particular to offer a counterpoint to May Day, which commemorated the state violence against the 1886 Haymarket demonstrators. The contrast remains between the North American Labour Day holiday and May Day, which is Labour’s day elsewhere. While May Day stands for the international struggle against capitalism, Labour Day signifies the accommodation of workers within the capitalist system. Canada and the U.S. are the only countries where Labour Day rather than May Day celebrates the achievements of workers. Accommodations are much, much different than achievements, especially with the disappearance of any social contract between labor and management involving an equal sharing of the benefits of work and wealth. When Labor Day becomes little more than a showcase and access point for politicians, that’s an even further dilution of the critical content of the day. We have to hang on to it of course. At least we have one day that we can still try to claim as our own, since almost every other day of the year seems to celebrate business and the rich for all of us, and perhaps especially for politicians. This entry was posted in ACORN International, canada, Citizen Wealth, Financial Justice, Ideas and Issues and tagged elections, Labor Day, voting, workers by Wade. Bookmark the permalink.